Infrared Water Damage inspections, conducted with thermal imagers and moisture meters, helps the water damage professional perform moisture investigations quickly and accurately, as well as providing an efficient way to visually document areas of wetness in buildings. Thermal Imaging does not measure moisture, but subtle temperature differences in building materials. This is due to a process called "evaporative cooling". Wet building materials often have slightly lower temperatures than dry ones. It's these slight temperature differences that can be detected with ultra sensitive infrared cameras, which produce thermal images. In generating a detailed moisture inspection report for you, we here at "1-877 Quikdry", will photograph suspected areas of wetness with both a digital camera and a thermal imager. These images will be used to compare and contrast wet and dry building materials. Suspect areas will be further checked and verified as either "wet" or "dry" using moisture meters. These readings will be documented and recorded as part of your report. Infrared reports using thermal imagers are not limited to moisture inspections. They can be used for detecting heat loss or gain from a building envelope, whether it be from around windows, doors or possibly missing insulation. Thermal imagers can also quickly and easily detect air leaking from HVAC (heating, ventilation & air conditioning) ducting, and for detecting overheating of electrical or mechanical components. Visit Our "Infrared Photo Area" to better understand the value of this diagnostic tool on a water damaged building. 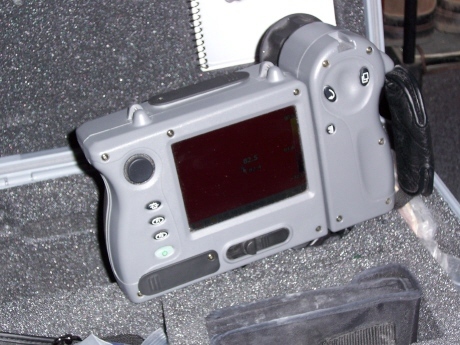 CLOSEUP OF THE "FLEXCAM", INFRARED, THERMAL CAMERA.